When I got my first heated cat bed for my cats I thought it would be a nice treat for them. They loved it and it soon became a little crowded, as I have seven indoor cats. Another bed was definitely needed and I got a large one, so they could share more comfortably. I finally ended up with three and will probably get a fourth. I knew that at least some of them would like it, but had no idea they would all be that crazy about it! Cats love warmth, as we all know from their habit of laying in a sunny window. I have some cats that like to lay underneath the lamps for the warmth of the bulb. Heated act beds are definitely right up their alley. Luckily my kitties are sharers, so at least two of them will crawl into one bed and snuggle. I would recommend getting a large bed though if you have more than one cat. It will work out much better that way. There are a lot of styles and sizes to choose from so you should have no problem finding just the right one. Heated cat beds seem only appropriate for the winter, but my cats use them all year long. In the summer, when the air conditioner is blasting away, they still head for their beds. I love watching them sleep in these beds because it is so obvious how comfy they are. They stretch out and then roll on their backs, or curl up into balls. If you're like me, seeing your pets so happy makes your day. One of the benefits of heated cat beds became clear to me when I noticed my oldest cat, who has some arthritis. She was getting to the point where she was not as limber as she used to be. She was slow in getting up and you could tell she was a little achy in the joints. I noticed one day when she got out of the heated bed that she had no problem getting up and she gave herself a good stretch after waking up. But it was a fluid, comfortable stretch, like when she was younger. I also noticed she was just generally more limber and comfortable throughout the day. 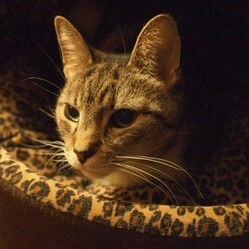 the heated cat bed was helping her arthritis symtoms. We all know how therapeutic heat can be and it's no different for our furry little friends. These beds are also great for when your cat is recovering from surgery. I know that at the vet clinic I go to they use heating pads after surgery. The heated cat bed is easier to use than a heating pad that you need to cover with a towel. 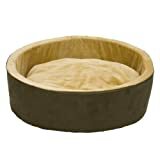 The therapeutic value of these beds is terrific and your cats will defintiely benefit from using them. Heated act beds are definitely a treat for your kitties. Check out these great heated cat beds! K&H Manufacturing KH ThermoKitty Bed Sage 16"
katiem2, I think they do have a higher tolerance for heat. Maybe because they have a higher normal temperature than we do? Thanks for your comment! What nice and cozy beds for cats. I have a couple of cats who will very much appreciate this. I read cats to have a higher tolerance to heat than we humans. Great beds! Thanks hamshi5433. I actually have 26 cats. I have seven inside and 19 ferals outside, but they have their own screened in porches to stay in. I only use the heated beds for the indoor cats, for obvious reasons. They make outdoor heated beds, but I've honestly never tried them. I wish I could have one to sleep in too...haha! lifeboost, thanks for the comment. They do make great gifts...I'm actually hoping my brother will get me another one for Christmas! This sounds cute! I do not have a cat but I would love to have this heated cat bed for myself though [if they have adult size] lool. mygosh you have 7 cats?? wow you really are a cat lover! Interesting article. A lot of my cats sleep with me, but they use the beds the rest of the time, so hopefully your "head kitty" won't abandon you at night! Great idea! I think my one cat would definitely enjoy, as he likes to sleep on my bed, and I have a heated blanket for myself. My other prefers to sleep up by my head, so she might not think its so great. I may have to try one of these out! Hi bizilady! I have used heating pads too, but always worried about how hot they would get, etc. These are much safer in my mind. Wow, 23! That's great. I used to put a heating pad under the blanket for my 23 year old cat. This is convenient.